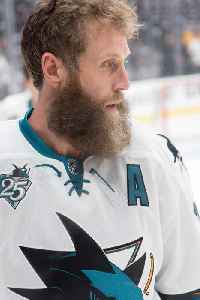 Joseph Eric Thornton is a Canadian-American professional ice hockey centre and an alternate captain for the San Jose Sharks of the National Hockey League (NHL). He was selected first overall by the Boston Bruins in the 1997 NHL Entry Draft and went on to play seven seasons with the club, three as its captain. During the 2005–06 season, he was traded to the Sharks. Splitting the campaign between the two teams, he received the Art Ross and Hart Memorial Trophies as the league's leading point-scorer and most valuable player, respectively.